We try to take lots of walks each week, especially in the evenings when Paulie gets home from work. It’s a nice time for as all to be together, get some exercise, and talk as a family. Theo’s favorite thing is spotting birds and dogs. Lucy usually likes to collect little nature treasures or show us her new hopping skills, but sometimes she’d rather just go along for the ride. 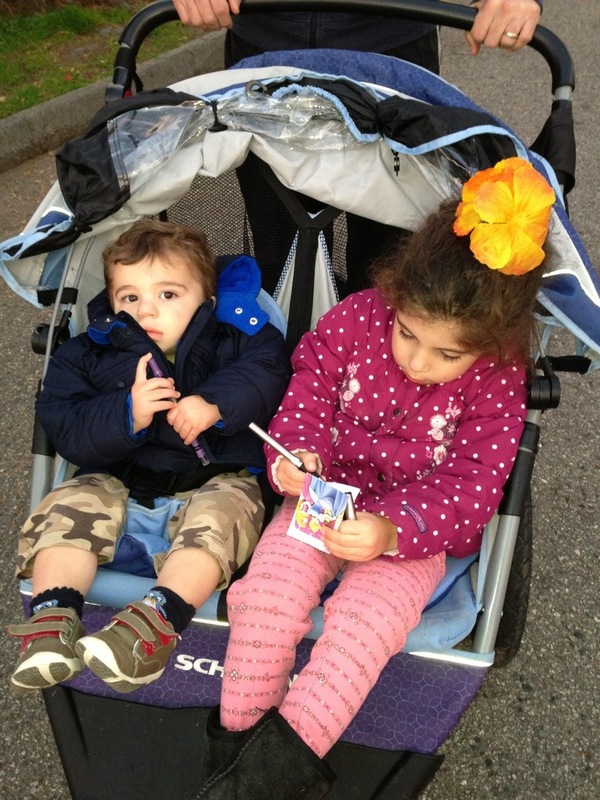 On these days she sometimes likes to bring a little notebook and pen and draw things she sees as she’s riding along in the stroller with Theo. 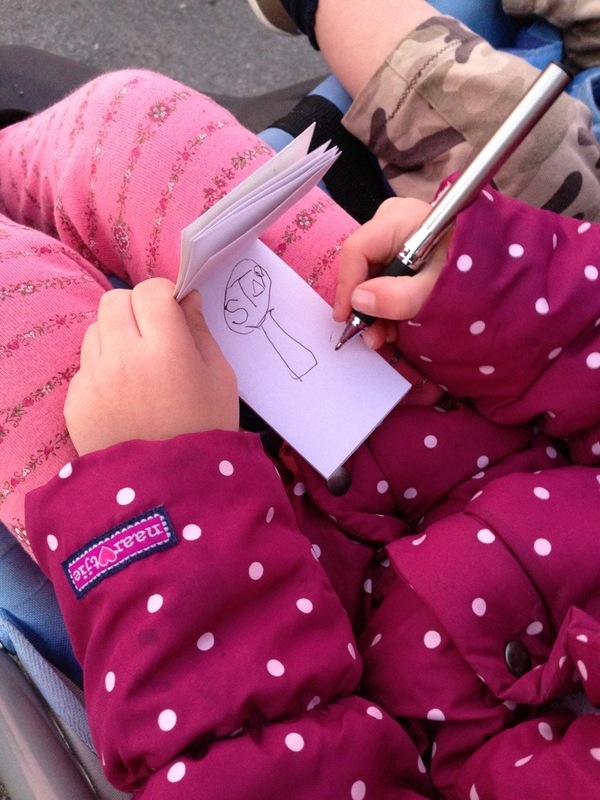 It’s fun to see what she deems important enough to be recorded in her notebook. I think today a stop sign, house, lamp post, and bush were lucky enough to be selected. 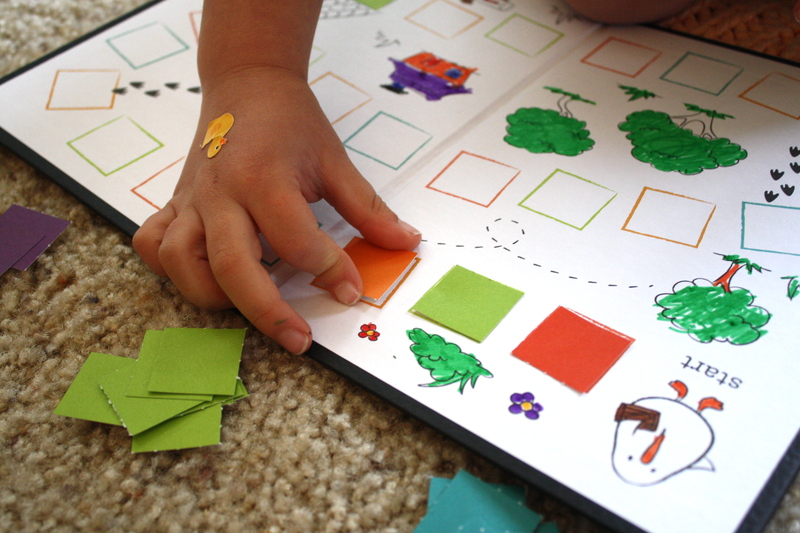 She has decided that things can not be repeated in her notebook so I’m interested in seeing what she chooses to draw as her choices narrow down over the next few weeks. Now, she still did not want to draw a tree, apparently it went against her self-imposed rule of not drawing something twice, but at least we had the opportunity to discuss and notice the details of things together. 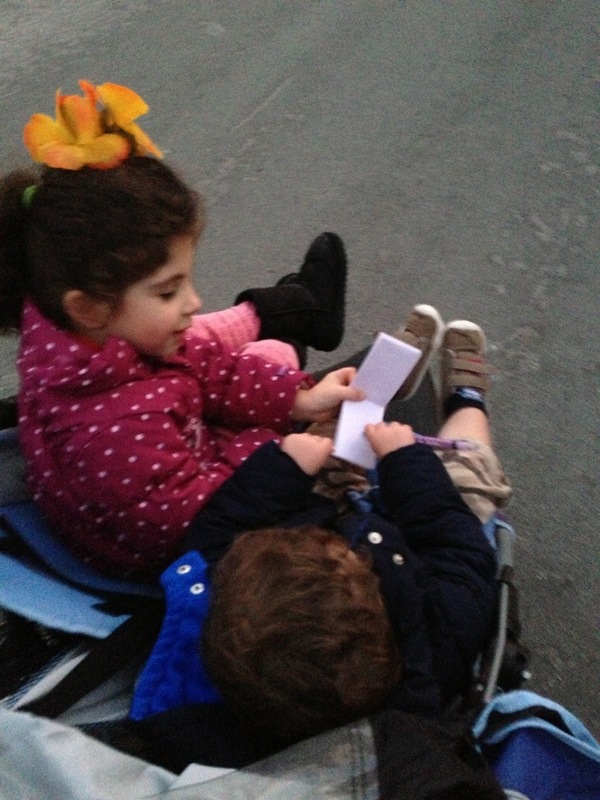 Our walk ended nicely with Lucy sharing her notebook with Theo, well…. for about a minute. Then she wanted it back. This did result in lots of screaming and grabbing as Paulie and I tried to help solve the disagreement. Eventually, it was just easier to walk faster and get home. I’m thinking next time we’ll let Theo bring one too! 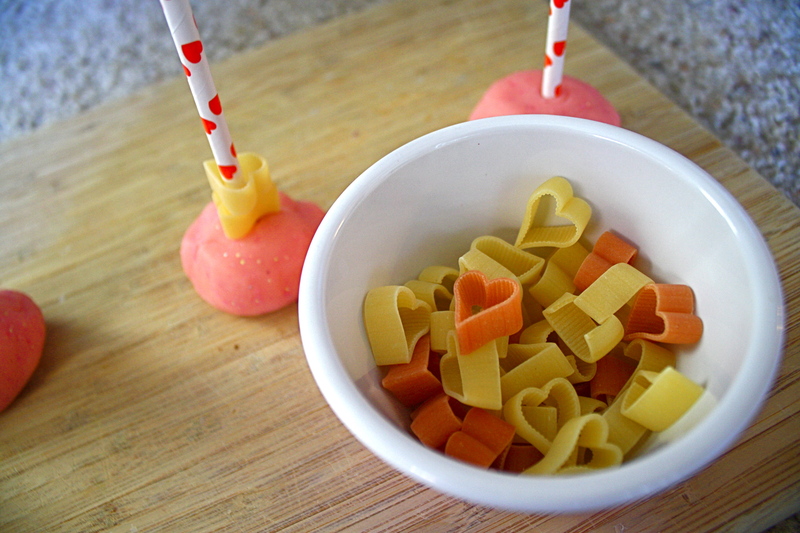 We are having so much fun with our heart shaped pasta! 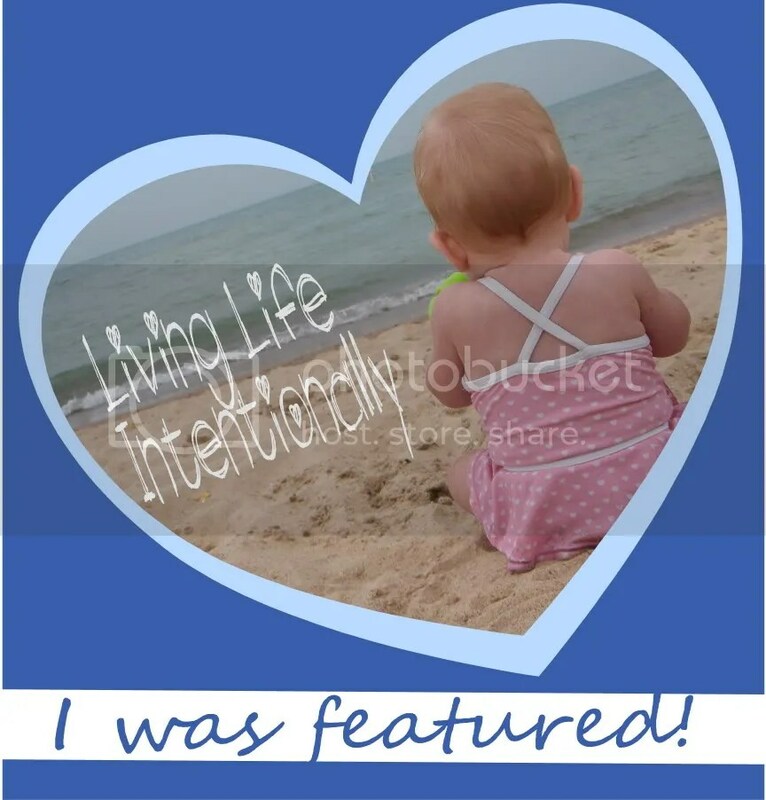 Who knew we’d get so many uses from it. 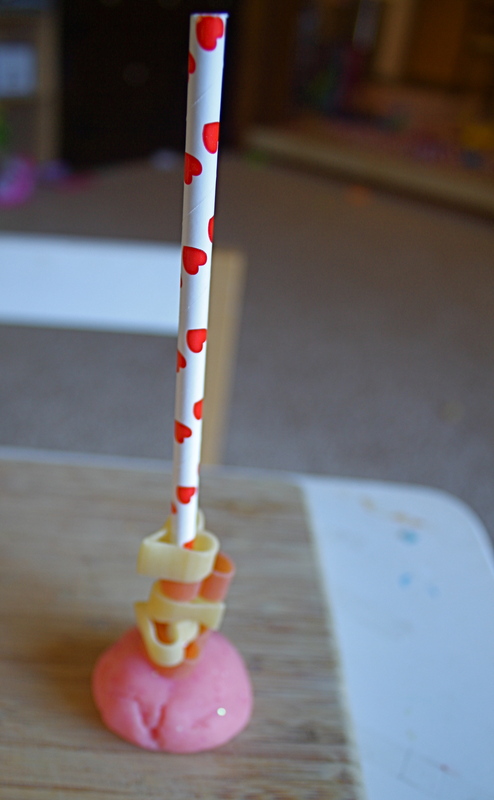 I had put some in our valentine sensory box along with some little straws, and Theo had been having a blast putting the straws through the pasta. 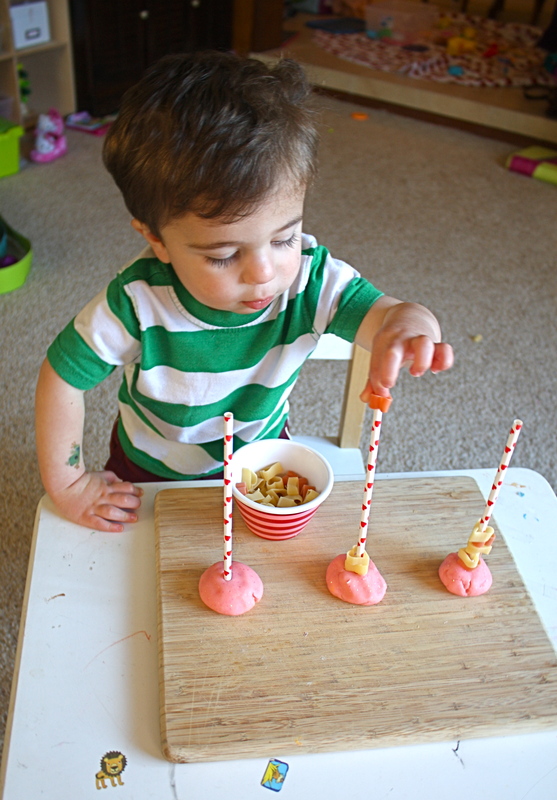 So why not make him his own little fine motor skill practice using the same materials! 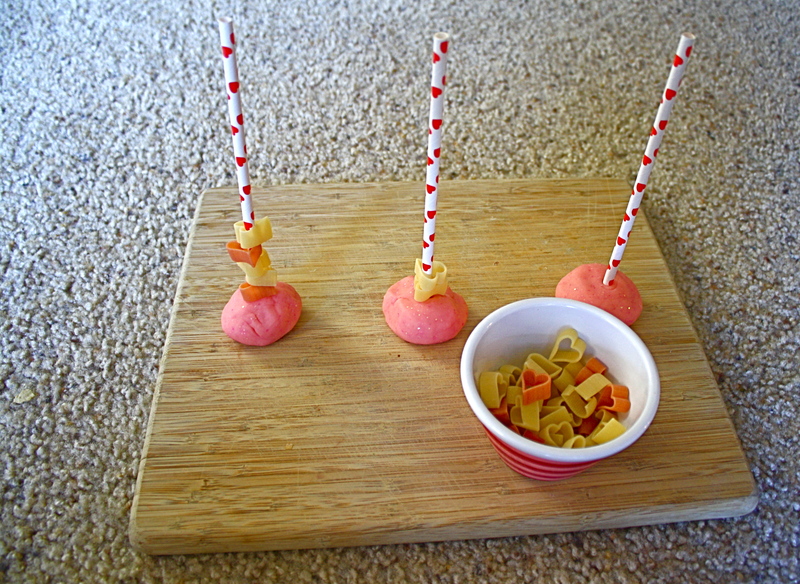 I grabbed a cutting board and some pink play dough we had made, stuck some heart straws in the play dough, and set a little bowl of heart shaped pasta next to it. Theo stacked and unstacked the pasta for quite a while! He also enjoyed taking it all apart and rebuilding it over and over. 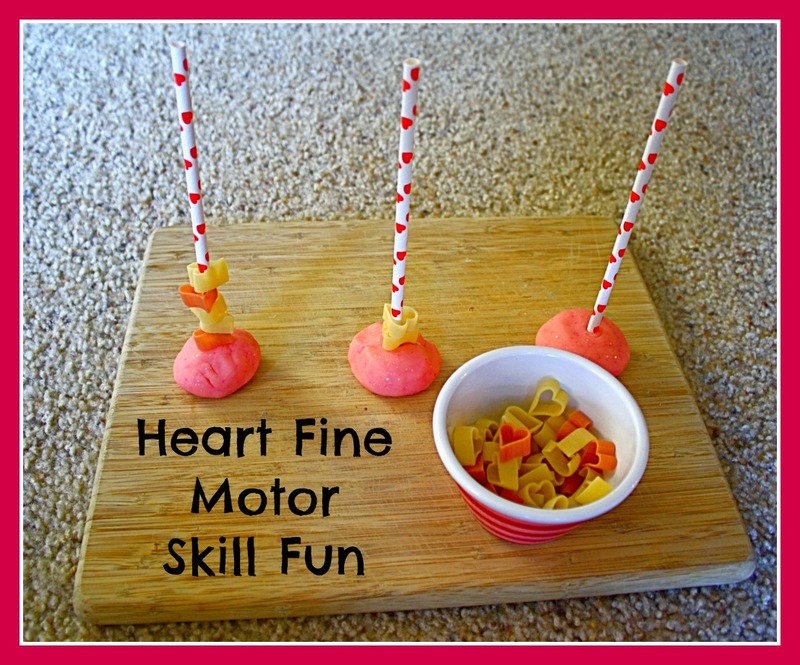 So much fun for little hands and great fine motor practice too! 2. 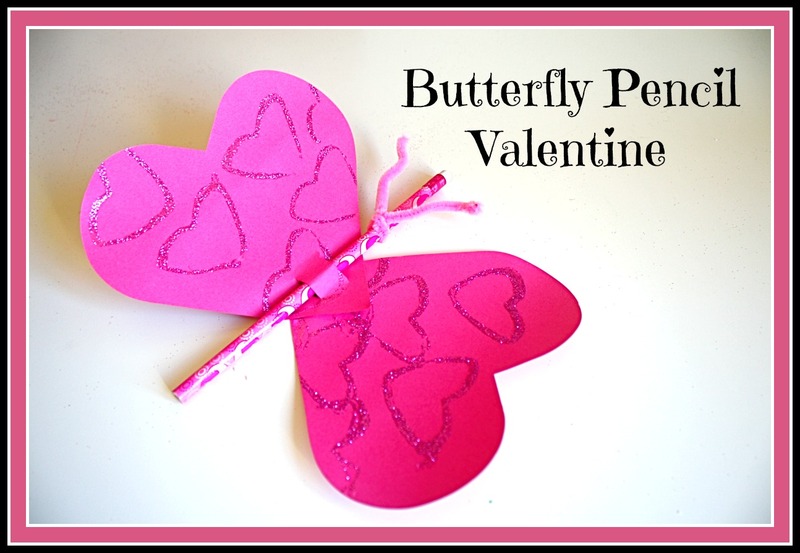 Choose the two hearts you want to use for your butterfly. 3. 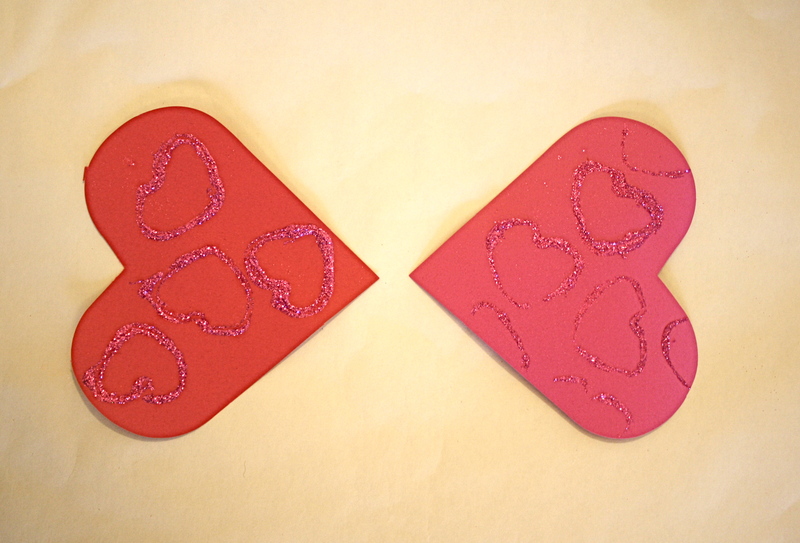 Overlap them by about 1 1/2 inches. 3. 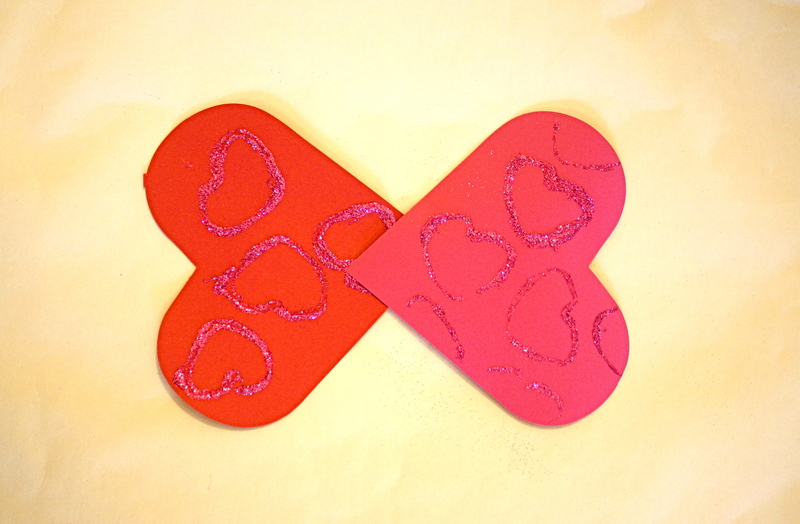 Holding the overlapping part together between your fingers, fold the hearts as if they were a greeting card, with glitter sides facing out. 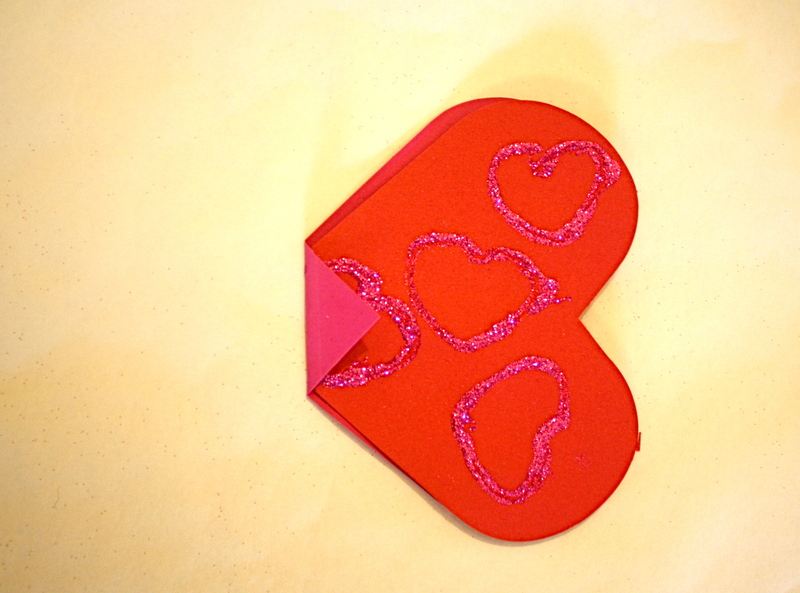 (In the photo below the glitter side of the pink heart is facing the table). 4. Cut two slits on the folded edge for the pencil. 5. 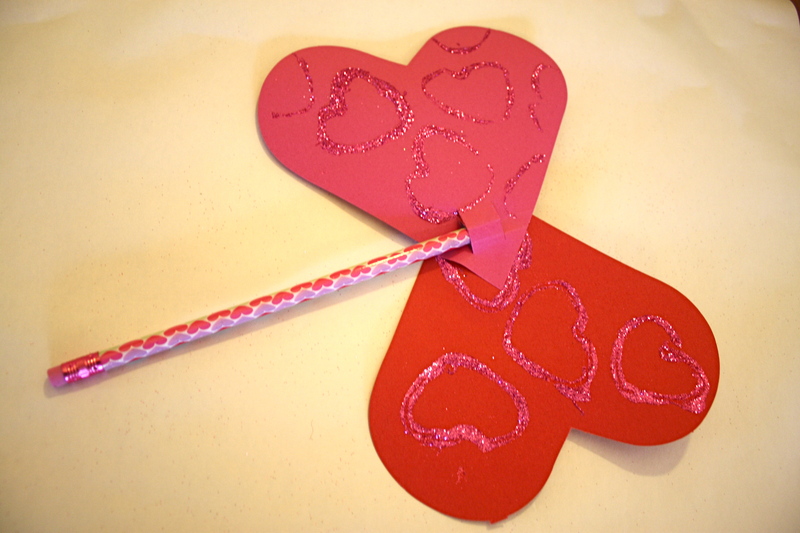 Unfold the folded edge and slip the pencil through the first slit…..
6. …. and then through the second slit. 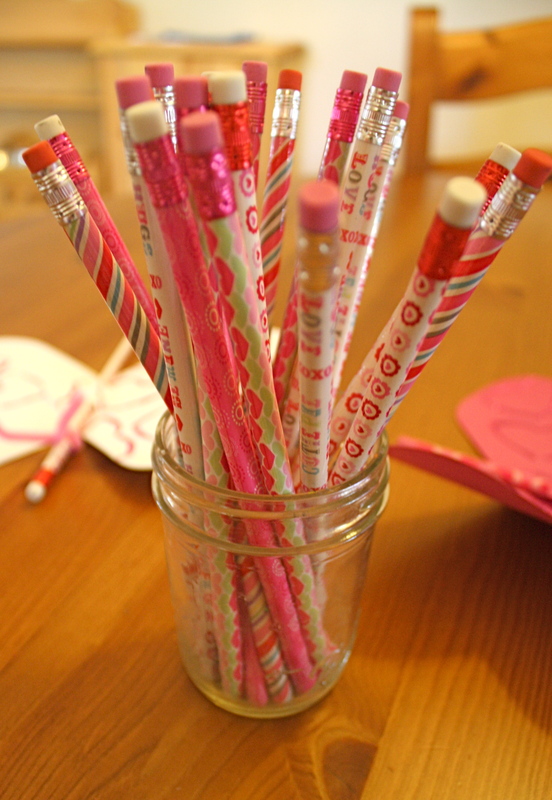 The pencil is now holding your hearts together. 7. 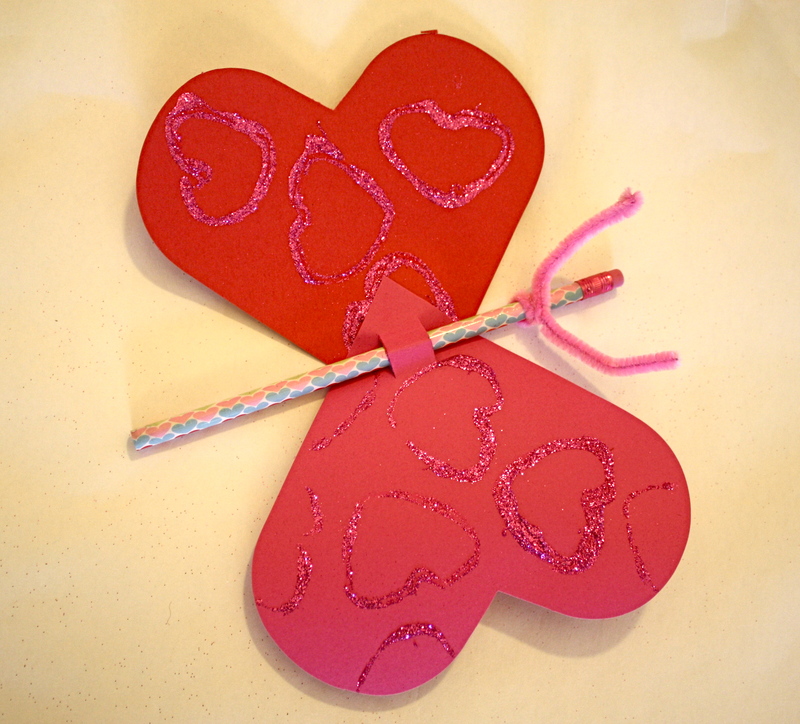 Use half of a pipe cleaner to add antennae, and you’re done! Lucy needed quite a bit of help assembling the butterfly. 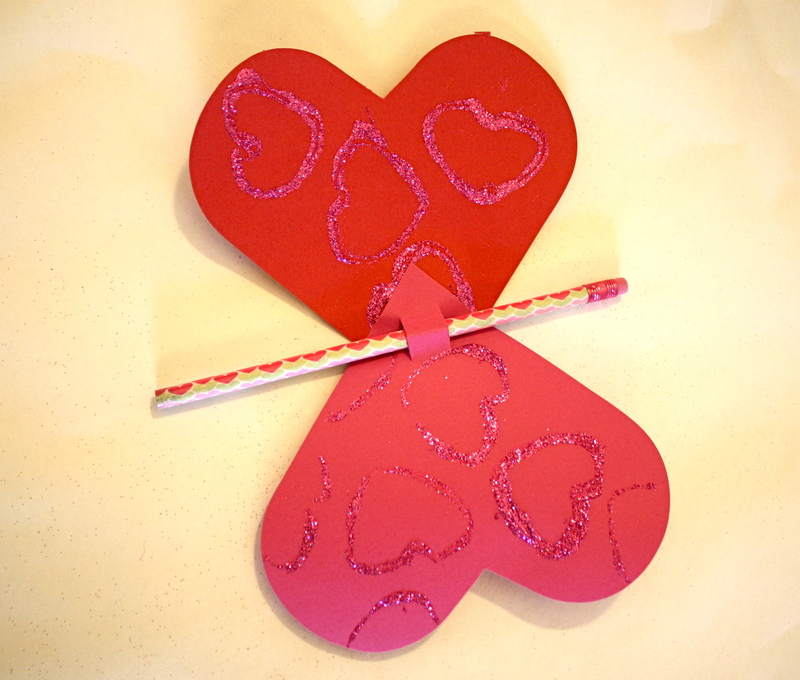 We finally got a system going~ she’d hand me the two hearts and pencil for the butterfly, I’d do the cuts and insert the pencil, then she’d attach the antennae and shape them. It didn’t take too long at all! 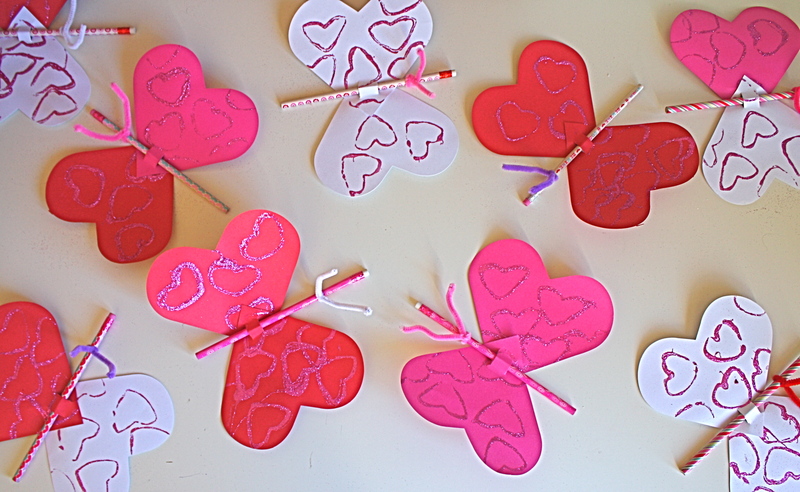 Now we are trying to decide if we want to write our valentine messages to her friends on the back of the wings or attach some kind of little note. Hmm….. we still have a few weeks to figure it out! I have to say this month’s Kiwi Crate came at the absolute best time! 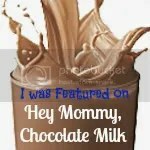 I was just getting over a virus that lasted almost two weeks, and I had been feeling like the kids were quite neglected as far as fun goes. 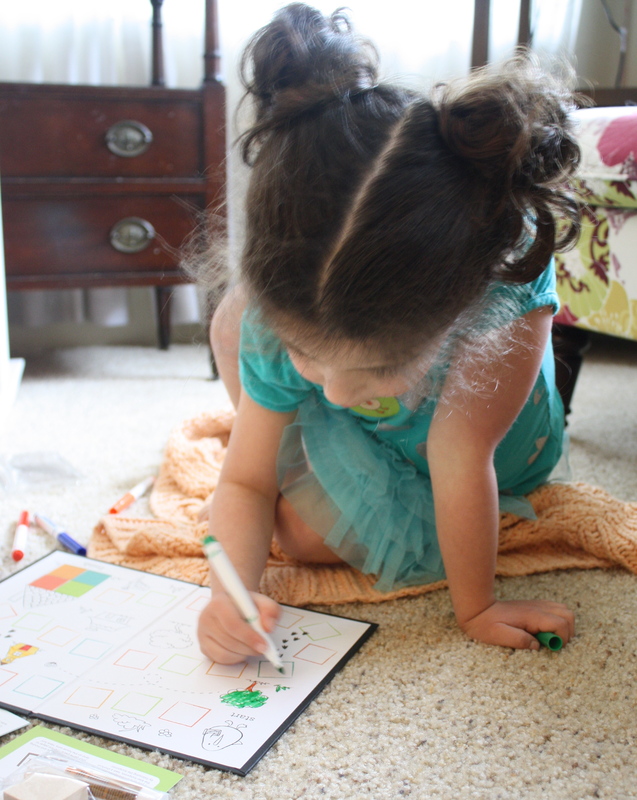 Here’s Lucy coloring the game board. I just could not get the energy to do anything. Thank goodness the Kiwi Crate came to save the day! 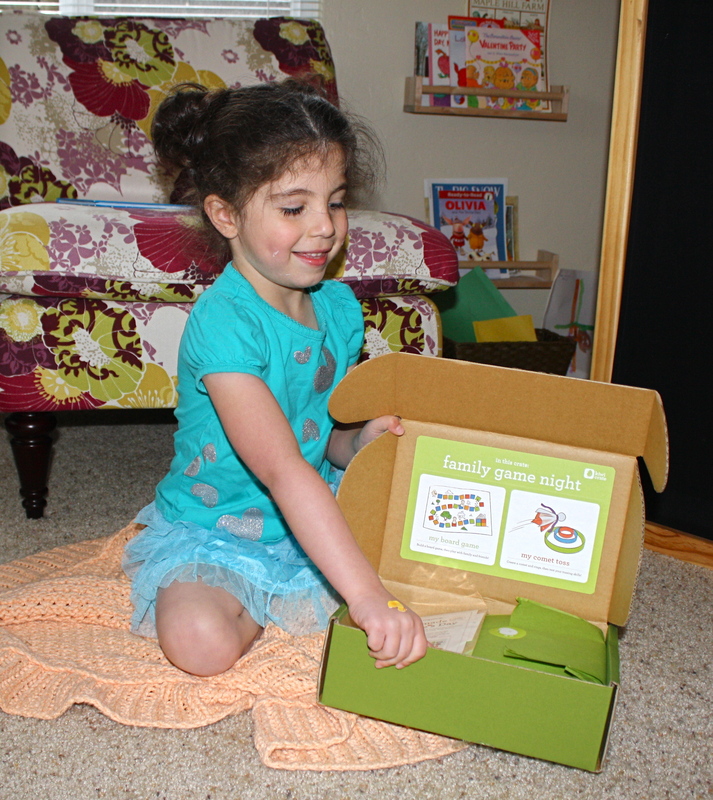 This month’s crate was themed “Family Game Night” and came with two game activities~ making a board game and a comet ring toss. Lucy was dead set on making the board game first. She couldn’t wait! She loved being able to build and decorate the game supplies herself. 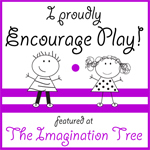 We had fun playing the game together, and she’s excited to share it with her friends at her next play date! The next day we made the comet toss game. 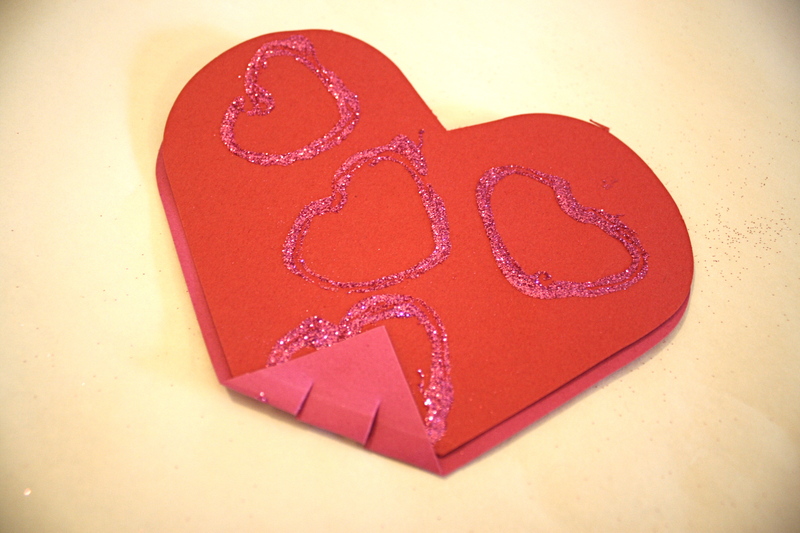 Lucy gathered the materials, read the directions, and built it with me. 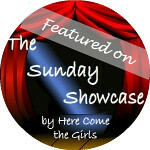 This was also fun to play! Theo joined right in (although we had to help him practice taking turns and not running off with the rings!) 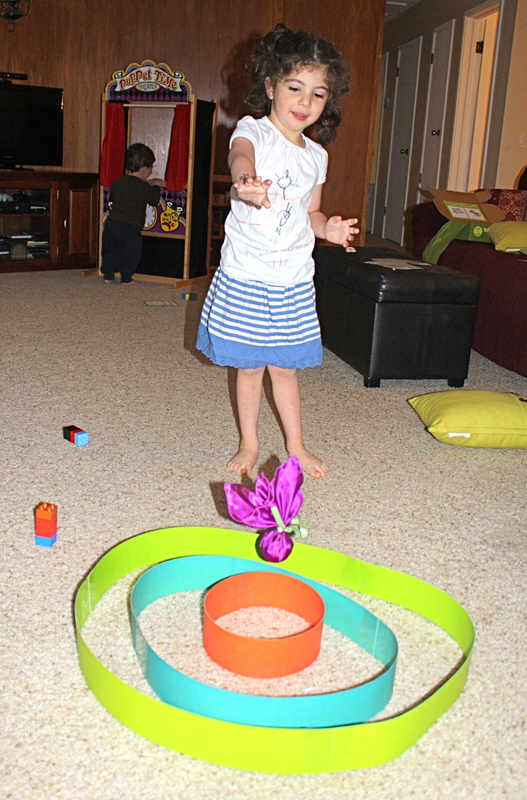 Lucy loved setting the rings up in different formations and trying to toss the comet into them. 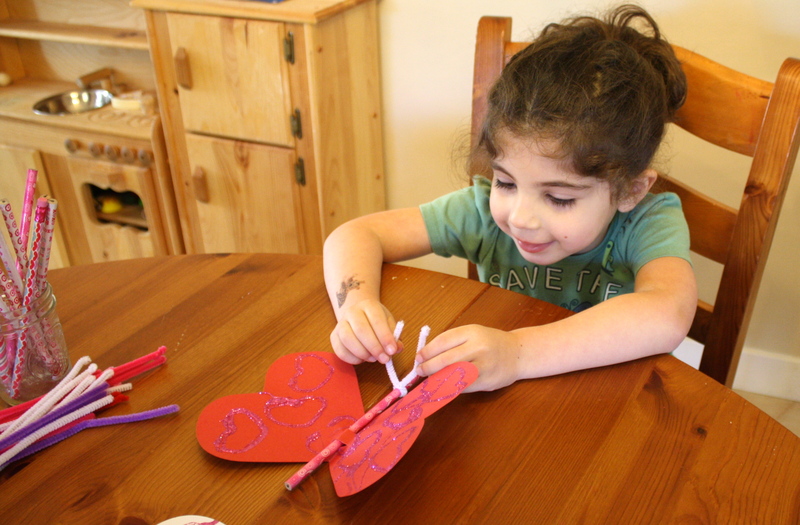 And what I love most about the activities~ the kids always think of more fun things to do with the supplies so the fun just keeps on going! 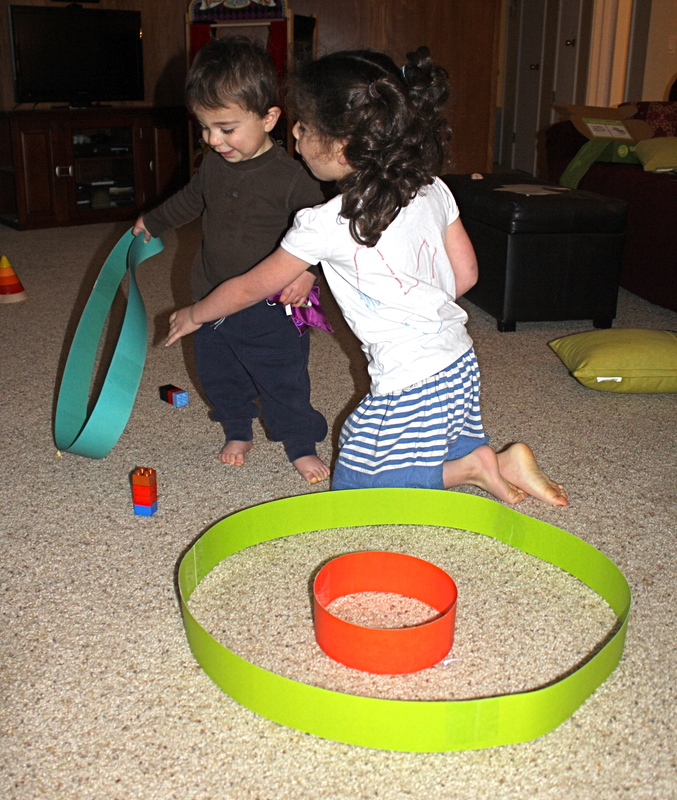 Today the kids lined the rings up like a hopscotch board and jumped back and forth through them. 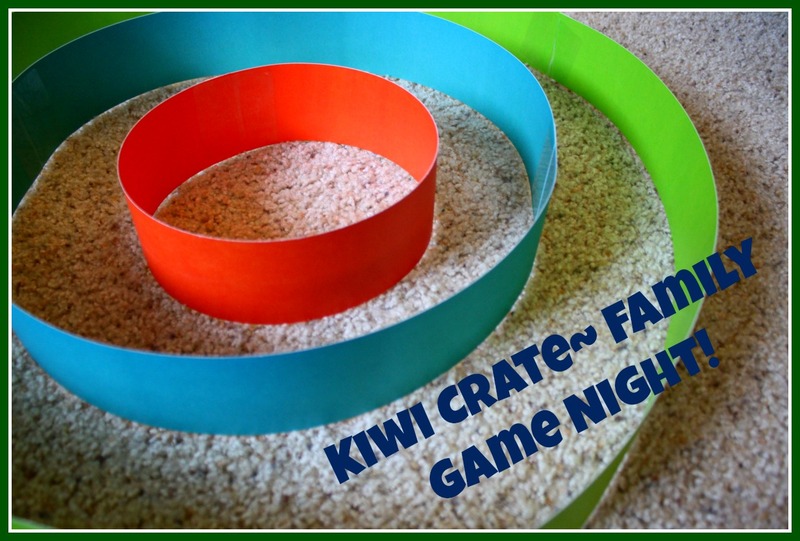 Kiwi Crate has pinned a lot of family game night activities on their Pinterest board so I’ll be checking those out next!